This brand new cabin is a craftsman style home filled with rustic elegance that has a style that is all it's own. Enjoy the rustic decor and clean angles with soaking in the hot tub or playing pool in the game room. Let the kids bunk up together in the bunk room that sleeps six, or leave the kids at home. 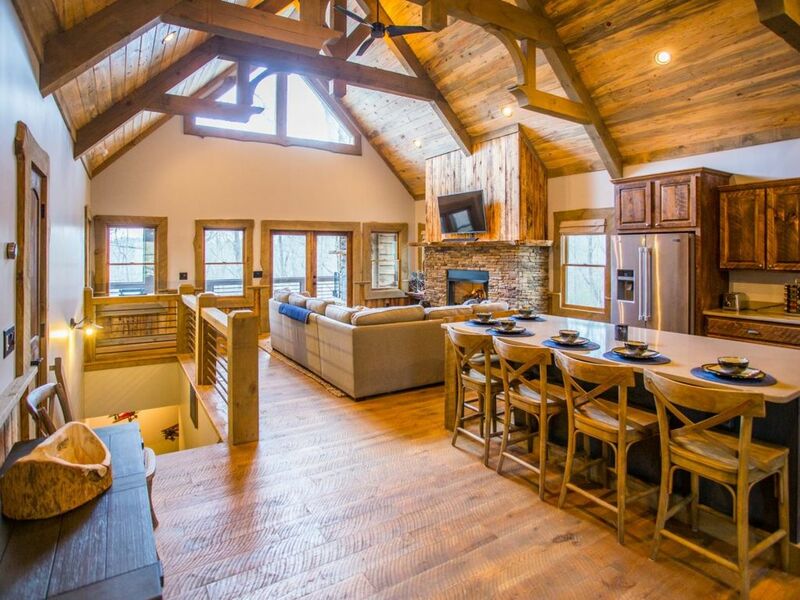 This cabin is perfect for two couples with children to escape from the hustle and bustle to the mountains, or for a single family looking to get away. Enjoy the outdoor fireplace and screened in porch, or the open deck with over sized swing. Either way, this is a kind of comfort you won't forget. The cabin is located close to town and has all paved access to the driveway. Full Kitchen equipped with pots, pans, seasonings, herbs, spices, Keurig coffee maker, microwave, blender and all the essentials. The rates are based on 8 guests. For additional guests, it is $15.00 per additional guest per day. The absolute maximum for this cabin is 10 guests. My husband and I brought our 17 y/o son and his girlfriend up for a relaxing weekend away from work, college entrance exams, lacrosse and volleyball for some fun. The Rusted Barn was more than what we hoped for!! It seemed brand new with tasteful decor, a refreshing departure from the majority of cabins!! If mounted deer heads aren’t your thing, this is the place for you!! The furnishings, hot tub, pool table and porches provided us with a memorable weekend all less than 10 minutes from beautiful downtown Blue Ridge and grocery shopping. The ladies at the Willow Creek Cabins office are especially lovely as well!! We’ll definitely be returning, thanks for a wonderful stay!! My family of 6 (2 adults and 4 children) had a great time. The cabin was very clean and well maintained, the 6 bunks together was such an awesome idea. Each bunk has its own electrical socket and light, my kids had so much fun. The house has everything you need for your stay. They provided plenty of towels and the blankets on the beds are so soft. The wood details throughout the house are so pretty, every door has a custom frame. We absolutely loved The Rusted Barn!! We were 2 families with 3 kids, so the bedroom layout was perfect and mostly why we chose this cabin. The design was refreshing from the typical "cabin woods/bear" theme a lot are decorated with. The owner paid great detail into the design and minimal decor giving it a farmhouse feel (and less objects for kids to break lol). The sectional was also a huge hit, all 7 of us were able to sit comfortably together for movies, games and to relax. This home was well stocked for cooking and plenty of towels were provided for showering and the hot tub. It was very clean and Willow Creek Cabin Rentals was a pleasure to work with. The gas fireplaces were great, instant fire/heat without hassle or smokey smell. Also, less than 10 minutes away from Blue Ridge. We all loved this cabin & would recommend to all! This home was a perfect fit for our lazy girls’ weekend. Kitchen was well-equipped, everything was very clean and beautifully furnished. We spent most of our time around the huge kitchen island, on the big comfy couch, and of course in the hot tub! This is a beautiful house with a pretty view. The driveway is VERY STEEP. The cabin was exactly as described and the owners were such a pleasure to work with. We had a wonderful stay and would absolutely consider it again the next time we go back to Blue Ridge.